"The Dark Elf Trilogy" was the second series that R.A. Salvatore wrote. However, it should be read before his first because "The Dark Elf Trilogy" is based before. 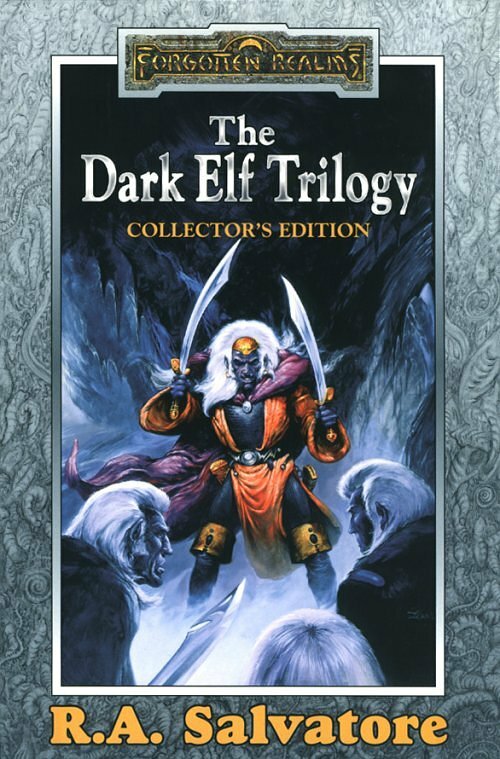 This trilogy deals with the early days of the noble dark elf Drizzt Do'Urden from his birth to his rebelious leave from the Underdark and his introduction to the Surface. Drizzt Do'Urden is raised in the evil world of the Dark Elves but as he gets older and is trained by his father Zaknafein, he realizes he must rebel and attempts to leave the Underdark. 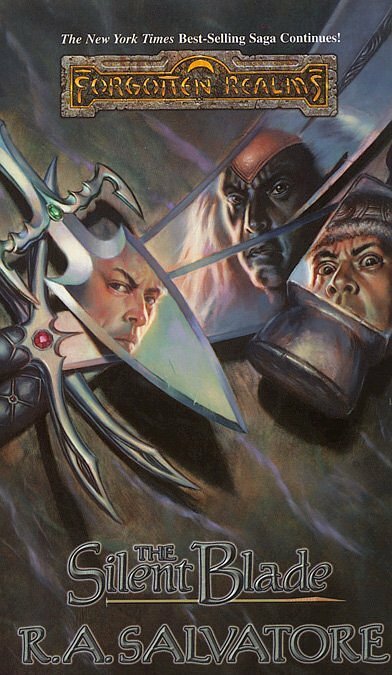 However, the Matron Mothers of Menzoberranzan are not easy to forgive and try desperately to sacrifice Drizzt Do'Urden to their evil goddes Lloth. Drizzt meanwhile knows that he cannot live in the Underdark forever and ascends for the surface. 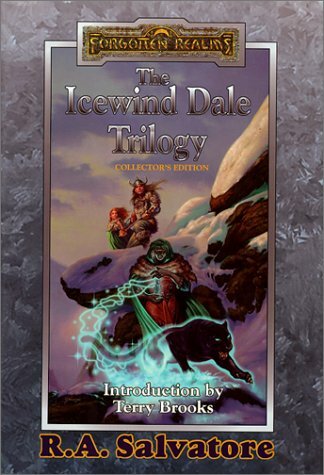 "The Icewind Dale Trilogy" is the first series that R.A. Salvatore wrote. This series is what made Salvatore famous. The trilogy is about the adventures of Drizzt and his band of friends including Bruenor the dwarf, Catti-Brie the human, Wulfgar the barbarian, and Regis the halfling. The first book is about the barbarian Wulfgar whom Drizzt is eventually asked to train. Eventually Drizzt trains the lad and the band of friends embark on a perilous adventure. In the second book, the band of friends search for the long lost Mithral Hall that the dwarfs used to live in, and in the third book the band must battle a powerful assasin to save their halfling friend. This is the series that made Salvatore famous. 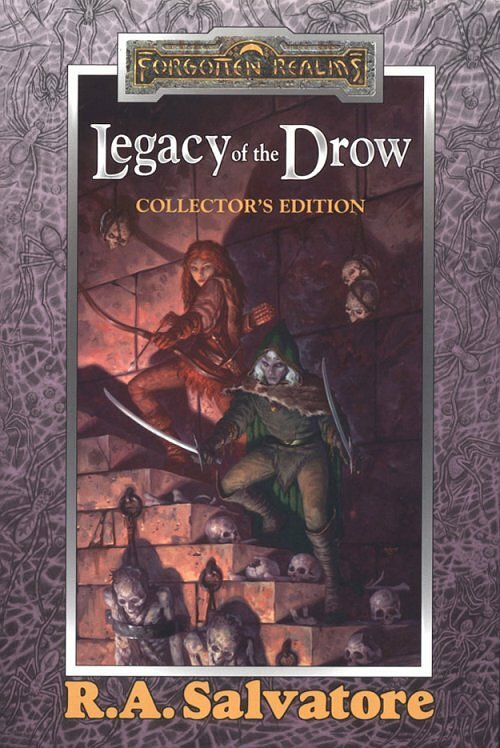 "The Legacy Of The Drow" is the series that deals with the four books after the Icewind Dale Trilogy. The books involved are "The Legacy", "Starless Night", "Siege Of Darkness", and "Passage To Dawn". Of course it is much cheaper just to buy it in the Collector's Edition above. In this Saga, you will meet new characters and villains as you read about Drizzt and friends battling enemies of old as well as new. Read as Drizzt returns home to the underdark and read as a tremendous battle between Drow and Dwarf are waged with Drizzt and friends in the middle. You will also read about the deaths and returns of many well-liked characters. "The Silent Blade" is the first book of the "Paths Of Darness Trilogy." Drizzt: The dark elf leads his friends on a mission to destroy, once and for all, the evil crystal shard, not realizing the full power of the call of Creshinibon. Wulfgar: Returned from the Abyss only to find his world crumbling around him, the barbarian Wulfgar struggles against an old enemy that may not be as deadly as the demons he carries within him. Entreri: The assassin finds himself embroiled in the power struggles of the darkest streets of mysterious Calimport and the even darker caverns of Menzoberranzan. But still his greatest enemy eludes him. 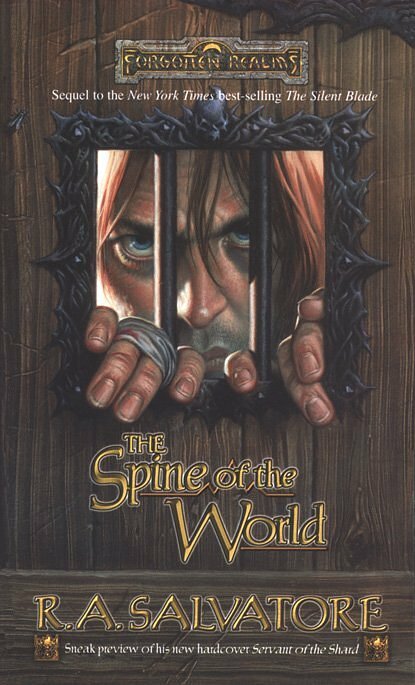 "The Spine Of The World" is the sequel to "The Silent Blade." Even the brutal streets of a treacherous city can't hide a tortured soul forever. The barbarian Wulfgar sets upon a dangerous path towards redemption when an old friend finds him in the city of Luskan. Wulfgar's journey twists up the windswept peaks of the Spine of the World. He will persevere, for at the end lies his most prized possession - the life he thought he'd lost forever'. This is a change out of the ordinary, for Drizzt Do'Urden is not involved in this book. 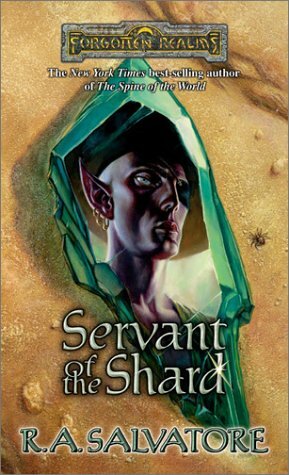 "Servant Of The Shard" is the third book in the "Paths Of Darkness" series. The dark elf Jarlaxle is bent on becoming all-powerful. He gets his greedy hands on the Crystal Shard, but soon the evil artifact's demonic force overcomes him. His assassin compatriot, Artemis Entreri, tries to help him break free, but the dark power of the Shard is too mighty. With time running out, they seek the assistance of the virtuous Cadderly. Surrounded by dark elves, Artemis Entreri tightens his grip on the streets of Calimport. While he urges caution, his black-skinned sponsor grows ever more ambitious. The assassin will soon find himself on a path his most hated enemy has walked before him - a path that leads to a place where someone like Entreri would never be welcome. 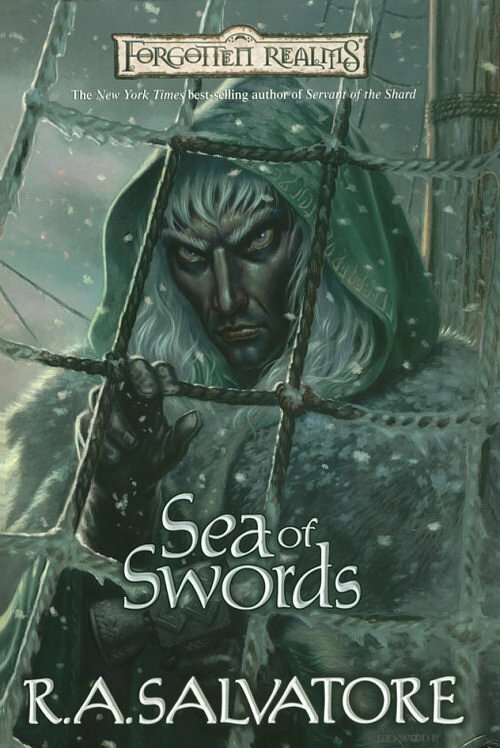 "Sea Of Swords" is the final book in the "Paths of Darkness" series. When the mark of the great warhammer Aegis-fang is found branded on the back of a vicious outlaw, Drizzt can no longer merely hope that Wulfgar is safe. The dark elf and his companions set out to find the barbarians once and for all. As they discover pieces of the puzzle their friend's life has become, Drizzt grows only more determined to locate him. As his friends search for him, Wulfgar sails with Captain Deudermont in search of the stolen Aegis-fang, now in the hands of the vile pirate Sheila Kree. But the pirate isn't willing to sit around waiting to be caught. She has other plans.